*This was originally posted on Aug. 13, 2013. Updates were made on April 26, 2016 and February 7, 2017. 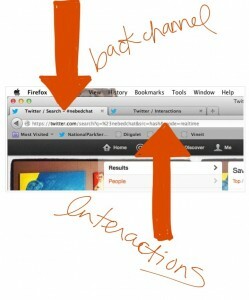 If you’re getting ready to participate in a Twitter chat for the first time, this little post may be helpful to you. I’ll be using #nebedchat (Nebraska Education Chat) as an example because it’s a chat I’m involved in either as a moderator or more frequently, as a participant. 1. The first thing to remember is always use the chat’s hashtag in all of the tweets you send in response to the chat. In this case, the hashtag is #nebedchat. 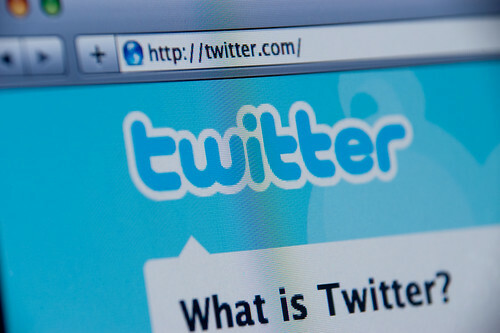 Make sure that you leave enough space in your tweet for that hashtag because it counts against your 140 character. 2. 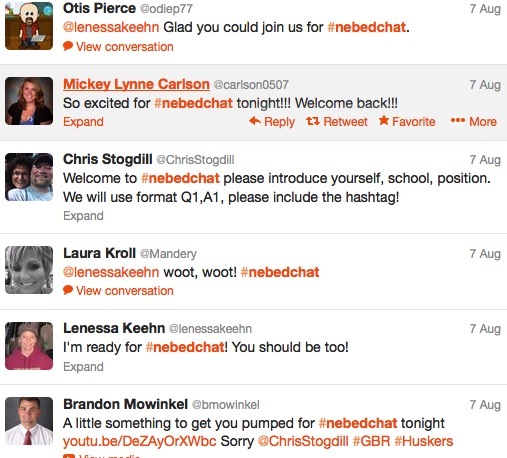 When you use a hashtag like #nebedchat, it creates a backchannel. A backchannel is just a place where ALL of the tweets that include the hashtag show up. You’ll notice a variety of tweets below. I captured this series of tweets whilst in the #nebedchat backchannel. 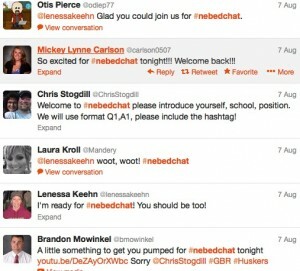 Notice that all of the tweets include the #nebedchat hashtag. NOTE: Click on the images in this entry to get a larger, clearer view of the screen captures I posted. 3. Make sure you are in the LIVE backchannel (This shows everything that was tweeted. ), rather than the TOP TWEETS tab, which will only show you the tweets that get “favorited” a lot. Some people use an app like TweetDeck to keep an eye on multiple hashtags, but when I am participating in a chat, here is what I do. I use Firefox, if I’m using my Macbook Air, and Safari, if I’m using my iPad, so that I can open multiple tabs simultaneously. I like to keep the backchannel for the chat AND my Twitter interactions tab open at the same time. That way I can see EVERY tweet posted in the backchannel as well as all tweets directed specifically to me. (Any time someone posts something with my Twitter handle -@morgetron- it shows up in my interactions feed.) I toggle between these two tabs throughout the chat. 4. When you first arrive to a chat, it is usual practice to introduce yourself briefly–usually your name and occupation will do, but sometimes a moderator will ask for additional information. In the tweet below, #nebedchat moderator, Chris (@chrisstogdill) asked everyone to introduce him/herself by tweeting his/her name, the school where he/she works or is associated with, his/her current position in said school and he briefly explained the preferred format for that night’s chat. Many time there will be someone else designated as chat greeter too, so don’t be surprised if after you introduce yourself, someone other than the moderator welcomes you to the chat (though sometimes the moderator does double as a greeter as well). During busy chats, this practice is sometimes dropped, but #nebedchat-ters are notoriously friendly and odds are someone will pipe in with a warm welcome. Chris was the moderator and posed Question #2, by indicating Q2. 6. Then, when you answer a particular question, you use the corresponding A1, A2, A3, etc. Cynthia (@cynthiastogdill) responded to Chris’s Q2 by indicating A2 (Answer 2). 6. During a chat you can respond to the questions posed by the moderator OR you can respond to what other people are saying. For example, you will notice that Laura (@mandery) responded to one of Chris’s questions. Then TJ Meyer (@tjmeyer12) responded to Laura’s tweet and included Kid President’s handle, (@iamkidpresident) since Laura mentioned him in her tweet. 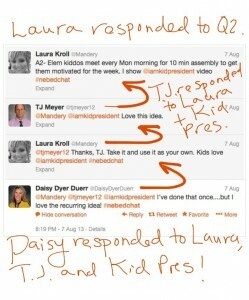 Laura tweeted back at TJ and then Daisy (@DaisyDyerDuerr) responded to Laura, TJ, and Kid President. 7. If you’re responding to what someone else says, you can just click on the REPLY link in the tweet to which you’re responding which should automatically format your tweet with that person’s (or like in Daisy’s case, people’s Twitter handles). You should still include the chat’s hashtag in your response though so that others involved in the chat can read your responses. Below, I included a screen capture of what it looks like when I clicked on the “reply” function on Daisy’s tweet. 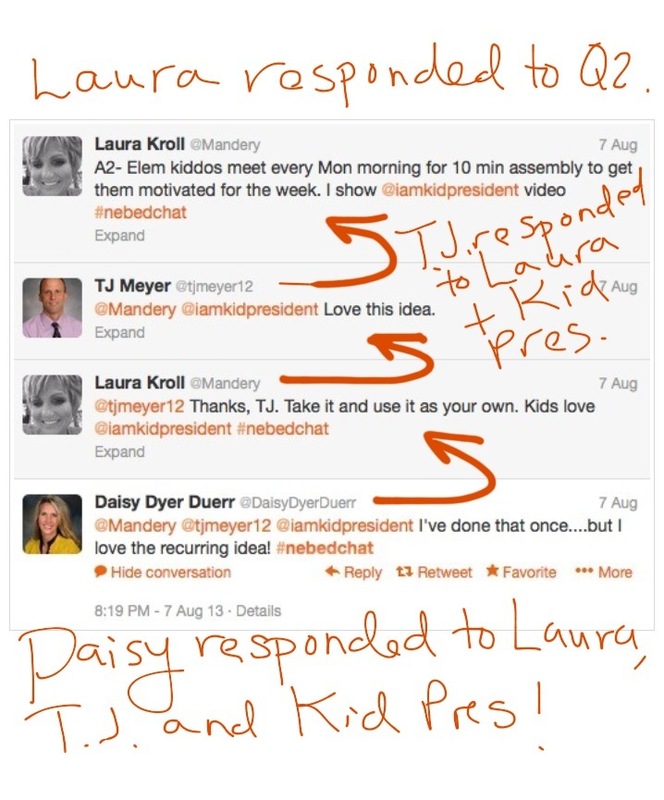 It automatically formatted my tweet to include Daisy’s, Laura’s, TJ’s, and Kid President’s Twitter handles. If I wanted to just reply to Daisy, I would remove the others’ names. 8. The main thing about Twitter chats is this–> You’ll be sharing in learning by communicating with people from all over. (You’ll notice that many people who participate in #nebedchat are educators from Nebraska, but others will be from elsewhere. For example, Daisy is from Arkansas. We have people joining us from all over the U.S. and from other countries as well.) View it as a friendly conversation–like people gathering at a coffee shop to discuss common topic of interest. It’s really low-pressure and you will be able to both give and receive helpful information. 9. If you are new to Twitter or new to Twitter chats or just a nervous lurker with a desire to break free from lurker status into active Tweep, #nebedchat is an excellent place to start. I would argue it is one of the friendliest chats out there. As long as you are there in the spirit of learning, everyone will deliver a warm welcome to you. Are you still unsure about this? It’s okay to try things of which you are unsure. If you are really nervous though, tweet me (@morgetron) or send me an email and I will answer any questions you have: morgetron@gmail.com. My friend@THLibrariZen and I will be moderating #nebedchat (Nebraska Education Chat) on Wed. February 8, 2017 at 9 PM CST. Rather than a topic, we will have a theme, and all of our questions are inspired by Tina Fey and Amy Poehler. We hope you can pop in. ← Student Reflection … YES … but how?